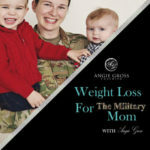 Welcome to the 5th episode Weight Loss For The Military Moms Podcast. This weeks episode we dive deeper into the model and take a look at the beliefs we have around our body and our weight. Your belief system is creating your life and you get to choose what you ultimately believe and the life you want for yourself. And! If you don’t like what you are feeling, change your belief.